Another quilt top done. Hopefully I can get this quilted soon...I need to make a trip to JoAnn's for some thread and basting spray. I love the Katie Jump Rope line, so this will probably be a favorite. and, I couldn't resist some of the far, far away line of fabric (i haven't bought fabric in forever). the princess and the pea print is too good to pass up. oohhh i already love the katie jump rope quilt. 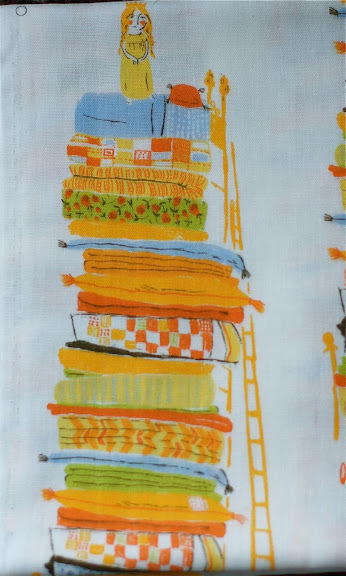 and the princess and the pea fabric is way too cute for words. 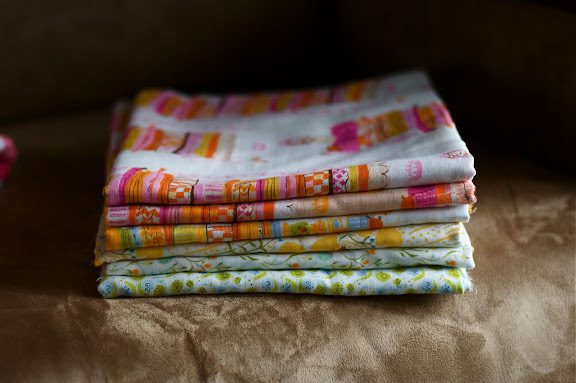 It's funny how I often pass by fabrics/patterns in the store because I can't think of a good use for them, and then I see them on blogs like yours and they look awesome in a quilt. You've got a good eye for colour - love the Katie Jumps Rope quilt and look forward to seeing the whole thing. I have been collectiong 1/2 yard cuts of the KJR to make a quilt...some day!! I also love the Princess/Pea fabric, I am hoping to swap for some on the flickr swappy poo group! I agree...Katie Jump Rope is an absolute favorite. And those prints are sooooo soft! I love the quilt with the Katie Jump Rope. Love all you do. Head to my blog to see the base squares I finished today for my bird quilt! Love them! I agree with "Sunshine." I see these cute quilts done with fabric that didn't really appeal to me at all. Until I see them in a blog. And then I must have the fabric. My pocketbook has been taking a big hit lately. Your KJR is really cute! I love the quilt top you have made. So colorful! I also ordered some Far Far Away fabric, from far away. Awaiting its arrival in them mail! So, what can I say? I too love KJR -- you made it shine in your quilt. I have been following your blog for only six months and this quilt is perfection in my mind. I normally don't comment, but felt I must on this one. I love the Katie Jump Rope quilt! It's just wonderful!!! I am also starting to fall in love with the Katie Jump Rope fabric line! I love what you did with it. 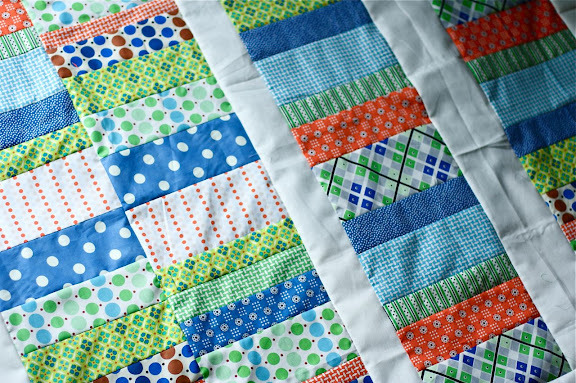 Katie Jump Rope Quilt is so lovely. I just bought some of that line yesterday...can't wait to get cutting! I love Katie Jump Rope too and your quilt! Far, Far Away is hard to say no to. Hope you're feeling well. The quilt top is fabulous! I can see why you couldn't resist the Princess and the Pea. Gorgeous quilt!! I love Katie Jump Rope (I made a bag out of it already) and the Princess and the Pea fabric is so fun! I may have to get my hands on some of that! i missed out on katie jump rope when it came out but i love it and i'm gonna have to hunt more down... nice quilt!! Oi!I love crochet end patch! adorei seu blog! bjs! Mônica. this is going to be great. i love that line of fabric too. Super cute. I keep looking at that princess and the pea fabric thinking "what would I do . . ." fun. The quilt is great, and the fabrics are to die for! i love the katie jump rope quilt! it's hard to go wrong with those beautiful fabrics! and i just might have to break down and get some of that far far away fabric. i'm seeing it everywhere and it does look fabulous! The Katie Jumps Rope quilt is fab, and I can't wait to see what you do far far away, like amandajean I may have to give in to temptation and order some! That quilt is lovely and the new fabric is so cute .